Join the Greater Long Branch Chamber of Commerce for our first ever “Taste of Long Branch”. We will be showcasing the local restaurants and their talented chefs! We will have 16 restaurants preparing food and there will also be a cash bar. 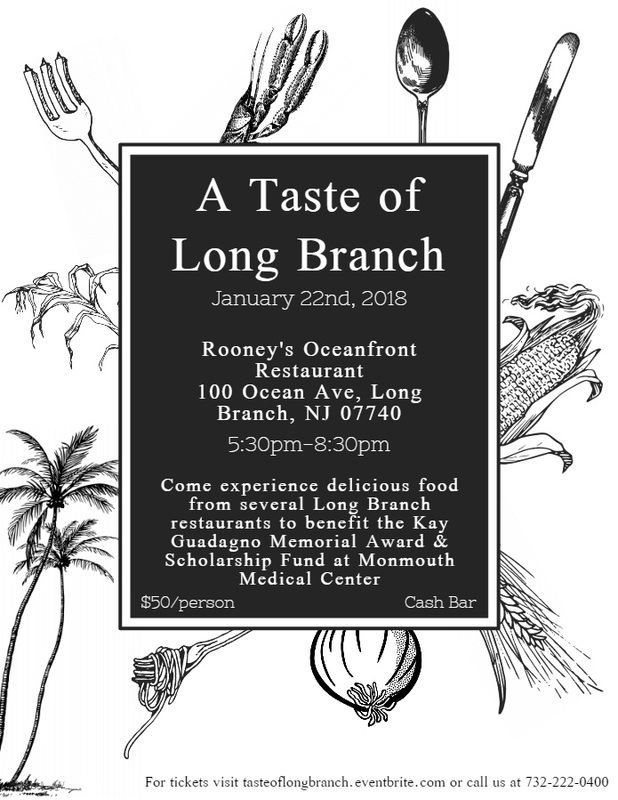 The event will be held at Rooney’s Oceanfront Restaurant on January 22nd, 2018 from 5:30pm. to 8:30pm..
Tickets are $50 each and there are sponsorship opportunities available. We have a limited amount of seating for this event so be sure to buy tickets before it sells out! The event will be benefitting the Kay Guadagno Memorial Award & Scholarship Fund at Monmouth Medical Center. The award and scholarship fund was established to help carry on the spirit of Kathryn “Kay” Guadagno, Assistant Vice President of Community Relations/Ambulatory Services at Monmouth Medical Center, who passed away in July 2013. Kay served as a guiding force in strengthening Monmouth Medical Center’s ties with the community for over 35 years. The Community Spirit Award is granted to a Monmouth Medical Center employee who serves the community by volunteering their time on an ongoing basis beyond the scope of their job responsibilities. The Excellence in Outpatient Care Scholarship is awarded to a clinical MMC staff member/caregiver who works at Monmouth Medical Center in the outpatient arena and is enrolled or seeking enrollment in a nursing/community health education program.